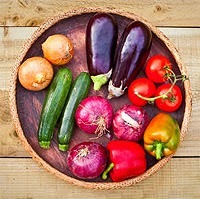 the Big World Blog: Who Really Uses Fresh Veg? Who Really Uses Fresh Veg? With fresh vegetables, out of sight = out of mind = rotten vegetables thrown away. Instead of putting peppers, cucumbers, tomatoes, etc. in the vegetable bin at the bottom of your refrigerator, put them in the utility/butter bins in the fridge door. You'll see them every time you open the fridge and this will remind you to use them. Put a folded piece of paper towel on the floor of the bin and put your cut onions, peppers, tomatoes, avocados, etc. face down directly on the paper towel--it will regulate the moisture of the veg without allowing them to be wet enough to rot. I don't change out the towel until it's gross, but do as you see fit. The vegetables simply do not spoil. Put a folded piece of paper towel in the bag with any bagged veg such as baby carrots, shredded carrots, bagged salad, etc. Again, this will absorb water and eliminate condensate that promotes spoilage, while keeping them moist and fresh. This trick also works for mushrooms, strawberries, etc.--any produce that spoils in the presence of free water or that sweats liquid as it ages. Another thing that most people don't realize is that there are both tropical and temperate vegetables. Typically tropical vegetables like tomatoes, egg plant, cucumbers are not supposed to be stored in a fridge. Things like apples, blueberries, blackberries, raspberries... those should be kept in the fridge... buuut botrytis grows in the 40 degree range, so you have a little while until they spoil (however the mold is not harmful, you breathe it in all day long). Another thing... the release of ethylene can be prevented by refrigeration. And if you don't want fruits to ripen faster, don't let them sit by bananas. They release a lot of ethylene. You would refer to this all as post harvest storage techniques. Climactic and non climactic fruits and vegetables. Basically, the difference in how vegetables and fruits are stored is based on how much they respire. The faster respiration occurs, the more the fruit breaks down.